We walked along the beautiful Lauterbrunnen Valley this morning. It is little wonder that, only 50 years ago, geologists had little idea of how the Alps were formed, or of the mess which is their geology. The thick beds of Jurassic limestone were deposited as calcareous mud around 140 million years ago, and the Alps began to form about 35 million years ago, when the African tectonic plate forced its way into the more stable tectonic plates of Europe and Asia. These mighty tectonic forces twisted and contorted the rocks, which have been exposed in the steep walls of the valley, which were carved out by glacial action during the last ice age. It is a valley of 72 waterfalls, falling from the 1500 ft walls, the most famous being the Trummelbach Falls, which are fed by 10 glacial waterfalls inside the mountain. The Trummelbach drains the glaciers of the Eiger, Monch and Jungfrau mountains and carries 20,200 tonnes of eroded sediment per year. It is thought that the Alps are still forming, the rate of erosion roughly being balanced by the rate of formation, but eventually, as with all mountain regions, they will disappear, and new ranges will take their place. I have limited internet access here in Wengen, so I can quickly check emails, and abstracts are now flowing in for November’s Cape Town conferences. Process Mineralogy ‘10 in particular looks set to become a major, so a reminder that abstracts for this, Bio and Hydromet ‘10 and Zinc Processing ‘10 should be submitted by the end of next week. We have had an amazing first week in the Swiss Alps. 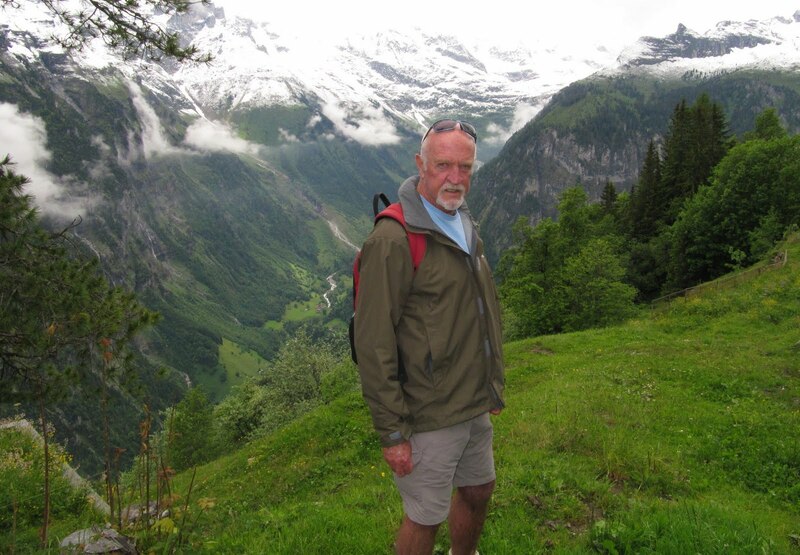 The Jungfrau region is a walkers’ paradise, thanks to links via cable cars and the mountain railway. The photos below show some of the beauty of this region. Apologies to all our regular readers, but there will be very little blog activity over the next couple of weeks. After last week’s intensive conferencing in Falmouth, Barbara and I are now spending some time relaxing and walking in the Swiss Alps. An opportune time to remind you that if you would like to be alerted by email when there are new postings, all you need do is submit your email address in the box on the right. Apologies also to anyone submitting papers to Minerals Engineering for review. There will be a short delay in allocating papers to reviewers. I shall be checking my emails every day, but will not respond fully until after 2nd July. The 2009 journal impact factors have just been published (see MEI Online). 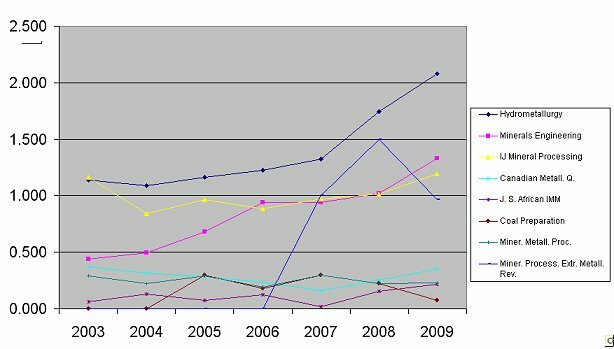 As in 2008, the specialised journal Hydrometallurgy has the highest impact factor, while Minerals Engineering heads the list of mineral processing and extractive metallurgy journals, followed by International Journal of Mineral Processing. This is great news for these three minerals engineering journals in the Elsevier triumvirate. Earlier this year (see posting of 5th March) they were the only minerals engineering journals to receive the highest A* rating from the Australian Research Council, a measure of the high esteem to which they are held. Last year (post of 6th February 2009) I reported that in 2008 there had been a staggering 288,845 downloads of Minerals Engineering papers from ScienceDirect. I have just seen the figures for 2009, and the number of downloads was well over 356,000. Although the majority of these are from subscribers to ScienceDirect, over 10,000 were from individual pay-for-view downloads. The countries downloading the most Minerals Engineering papers are China, Iran, Australia, USA and South Africa. In the same period, International Journal of Mineral Processing had over 189,000 downloads. Pay-for-view is an excellent way for small companies to access papers from any Elsevier journal. A single paper can be accessed for $31.50. I would like to make a personal thanks to all those who have contributed to the evolution of Minerals Engineering, by submitting work to the regular issues and to the special issues of MEI Conferences. A special thankyou also to my team of around 175 reviewers, who make the all important peer-review process run smoothly, and to the Elsevier staff, particularly Dean Eastbury and Suresh Amalorpavaraj. It's a pleasure to work with all of you. This morning was the Jacques Eksteen show, with 4 presentations by Jacques on various aspects of Ni-Cu matte pyrometallurgy. Luckily I was aware beforehand that Jacques is a fine presenter, as I have known him for many years. He is now a consulting metallurgist with Lonmin, and prior to that he was a lecturer at the University of Stellenbosch. 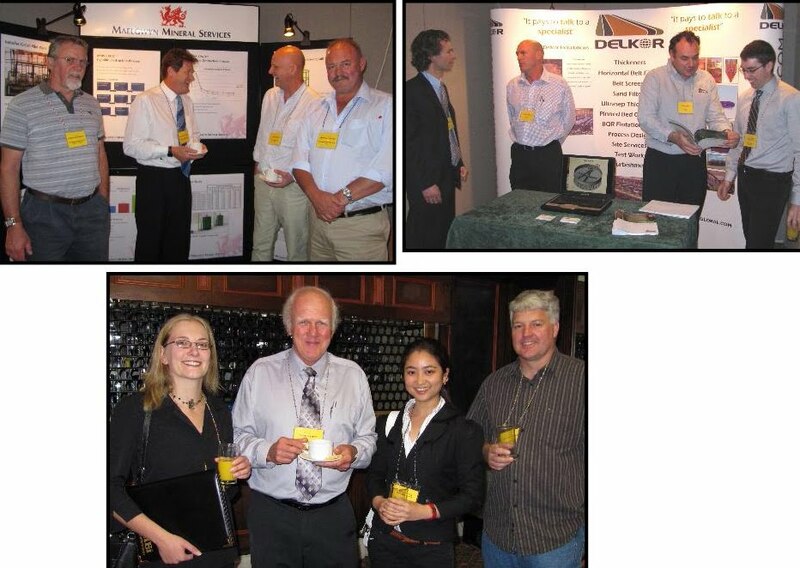 Incidentally, he also gave two presentations at Precious Metals '10, so it has been a hard week for him. Despite that he has managed to see a great deal of Britain during his visit. The final paper of the morning session was given by Arthur Barnes of Xstrata Process Support (XPS), Canada, who posed the question- nickeliferous pyrrhotite- waste or resource? 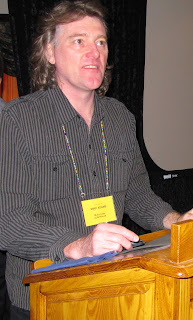 The afternoon session was chaired by Dr. Norman Lotter of XPS, who introduced the final three papers, from Canada, Australia and China, before finally summing up the conference. 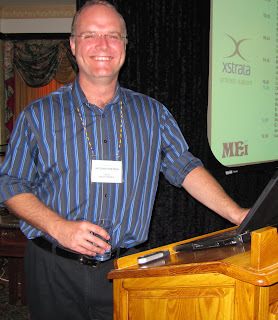 Norman will stay on as consultant for the next Nickel Processing conference, planned to be held in Cape Town in November 2012, following Process Mineralogy '12 and Precious Metals '12. This has been a fine small conference, blessed by wonderful weather which has helped delegates to network in the evenings. I would like to thank Xstrata Process Support for their sponsorship of Nickel Processing '10, and in particular Norman Lotter for his conscientious approach to his consulting duties. Norman and the rest of the Xstrata contingent are photographed above: Stanko Nikolic (Xstrata Technology, Australia), Arthur Barnes (XPS, Canada), me, Norm Lotter (XPS, Canada) and Martin Bakker (XT, Australia). Sixteen of the Precious Metals '10 delegates have remained in Falmouth for Nickel Processing '10, and this morning Jon welcomed them, and a further 20 new faces, representing Australia, Belgium, Canada, China, Finland, Norway, Russia, South Africa, South Korea, Turkey, UK, USA. He then introduced our consultant, Dr. Norman Lotter (left), of Xstrata Process Support, Canada, our major sponsor. Norman spoke of the state of the nickel market, and the challenges that lie ahead, before handing over to Dr. Terry Norgate of CSIRO, Australia, and Prof. Ismail Girgin, of Hacettepe University, Turkey, who chaired the morning session, containing 5 papers from UK, Canada and Australia. The timetable can be viewed here. We have some interesting new faces at this conference, including 5 delegates (left) who have made the long journey from South Korea to Falmouth, and another, Ozgur Goyker, representing the Natural History Museum in London. He is working in close collaboration with Anne Oxley of European Nickel plc on the leaching of nickel laterites. The afternoon session was chaired by Prof. Chris Pickles, of Queen's University, Canada, who introduced 3 papers from Turkey, USA and Canada. 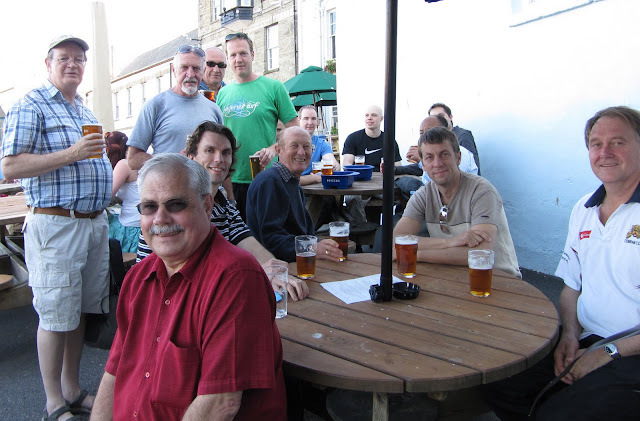 Then a quick coffee break before relaxing with ideal weather conditions on the coastal walk, with the usual beers awaiting us at the Chain Locker. A lovely hot sunny day in Falmouth today. 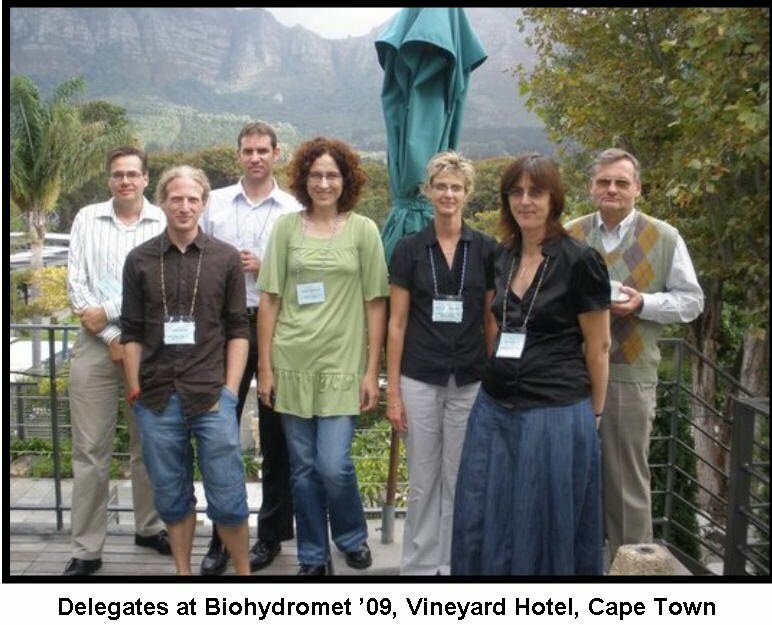 Only two delegates have failed to show at the conference, both from the JSC Chemical Company, Russia. It always amazes me that people can register, decide for some reason not to attend, and then do not have the courtesy to inform us by email. 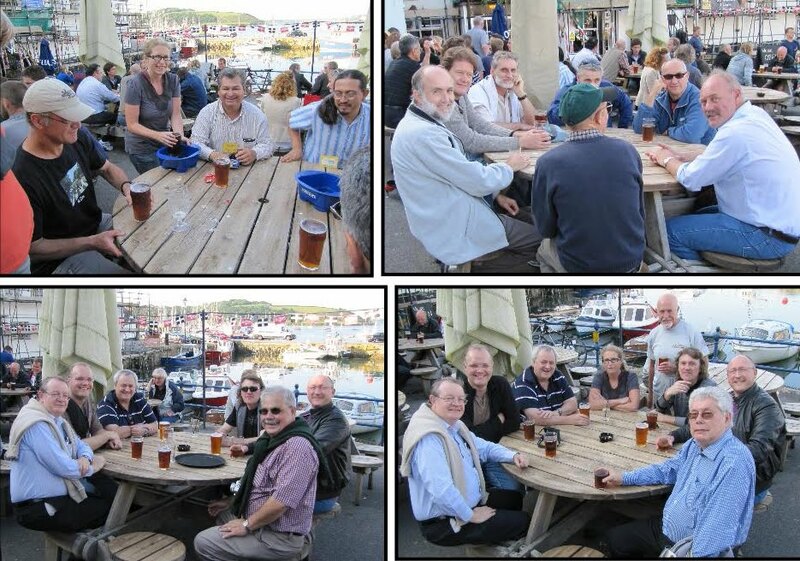 Some of the delegates are looking a little worse for wear this morning after sampling the various fine hostelries of Falmouth. Amanda arrived 10.15 - can anyone beat leaving the pub at 1.30 am? Another high quality session this morning, chaired by Dr. Rodney Jones of Mintek, South Africa and Dr. Isaac Amponsah, of Newmont, USA. Nine papers were presented, from Australia, South Africa, UK, USA, The Netherlands, Finland and Mexico. Dr. Mike Adams chaired the final session in the afternoon, with 6 papers from Canada, Australia, Mexico, Peru, South Africa, and USA. 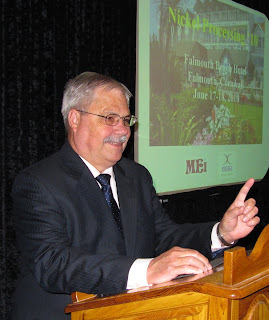 Mike then summarised the conference, before Amanda gave the final vote of thanks, inviting delegates to attend the next Precious Metals conference, which will be held in Cape Town in November 2012. It has been a pleasure for us to organise this event for such a warm, friendly and knowledgeable group of people. The afternoon session was chaired by Dr. Claude Bazin, of Laval University, Canada, who introduced 5 papers, from Canada, USA, South Africa and Spain. After a quick coffee, most of the delegates then joined me on a 2-hour coastal path walk, a taster of the beauty of Falmouth. Beer awaited us at the old Chain Locker pub in Falmouth town, after which we all dispersed in small groups to various local restaurants. It's been good to see many old friends from the past, including Dr. Simon Meik, of Dundee Precious Metals, Bulgaria, who spent some time at the CSM pilot plant in the late 1970s, working on the feasibility study for the Hemerdon Tungsten project, near Plymouth. Further studies are currently being made on this project, with a view to bringing the mine back into operation. It last produced tungsten during the Korean war, and also during the two World Wars. 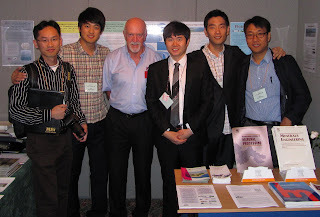 Also good to see Prof. John Monhemius after many years. This is his first MEI conference. He attended the first conference that I ever organised, a NATO Advanced Study Institute, also held in Falmouth, in 1986. See if you can spot him on the photos on the 12 September 2009 posting. A beautiful sunny day in Falmouth, and this morning I welcomed our 55 delegates representing Australia, Bulgaria, Canada, Finland, Ghana, Iran, Mexico, Netherlands, Peru, Russia, South Africa, Spain, UK, USA. After thanking our sponsors, Maelgwyn Mineral Services, Delkor, Newmont and Barrick Gold, I then set the scene, explaining why Cornwall's geology has made it such a unique and beautiful part of England. 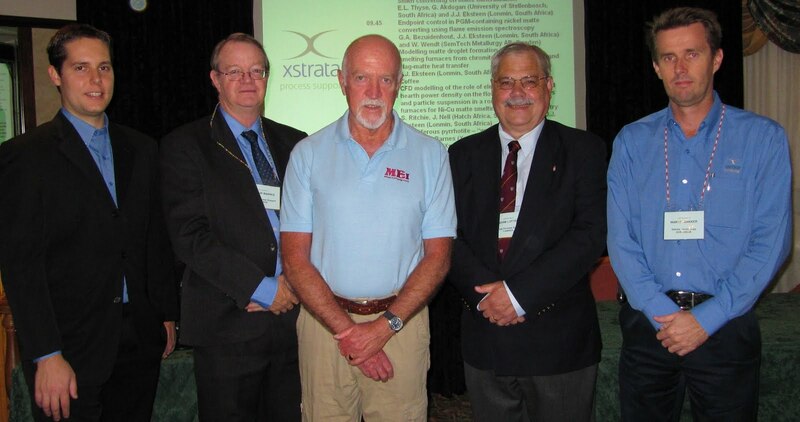 Dr. Mike Adams (left), of Mutis Liber, Australia, our conference consultant, then opened the conference, showing how in the 19th century aluminium was more expensive than gold, and how this conference has occurred at an opportune time, with current high prices for gold and PGMs, and new technology constantly evolving. Mike Battersby of Maelgwyn Mineral Services, UK, then chaired the first session, with papers from South Africa and Canada. Then a well-earned coffee break, to view the exhibits. We have a small exhibition at this event, Maelgwyn Mineral Services, Delkor and MEI having booths. After coffee Prof. Chris Pickles of Queen's University, Canada,chaired four papers, from Australia, USA, Canada and Ghana before we all adjourned for lunch. The conference timetable can be viewed here. All this week I will be reporting on Precious Metals '10 and Nickel Processing '10, which start tomorrow morning in Falmouth. The weather is beautiful, the delegate lists truly international, so all looks good for a week of fine technical presentations and networking. 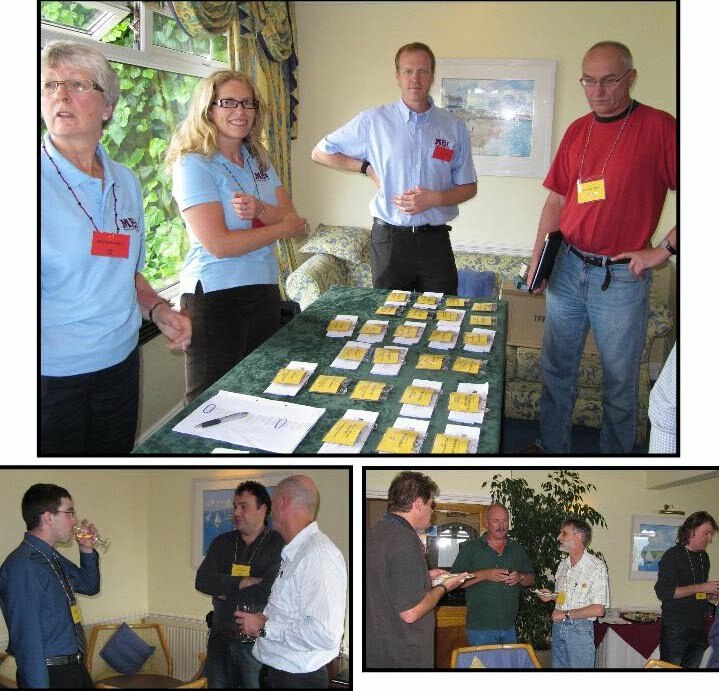 We kicked off this evening with a welcoming wine reception and pre-registration at the Falmouth Beach Hotel. 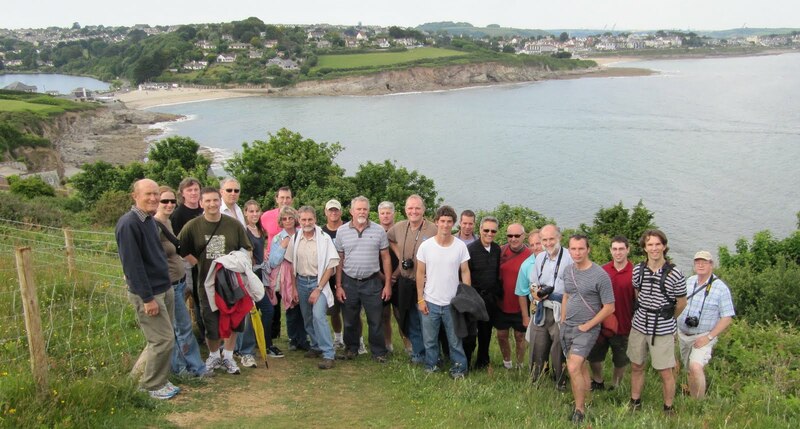 We had a great 7-mile walk this afternoon, along what is arguably Cornwalls' most important mining archaelogical trail. The Great Flat Lode is an enormous ore bearing body dipping at an angle of between 10 and 45 degrees, situated in the Camborne-Redruth area of Cornwall, about 10 miles from Falmouth. Normally lodes are found perpendicular to the ground surface or at best at angles of about 60 degrees. The Great Flat Lode got its name as in relative terms it lay a lot flatter in the ground, so that mines could extract the tin and copper ores from the ground at moderate depths. The mines of the Great Flat Lode helped to provide employment at a time when the rest of the Cornish Mining industry was in decline. As the copper ores became exhausted in about 1870, the mine owners explored deeper finding fine high quality tin concentrations underlying the copper. This gave the mines of the Great Flat Lode a new lease of life. After some of the companies amalgamated in the late 1890's the mines continued producing until about 1918. 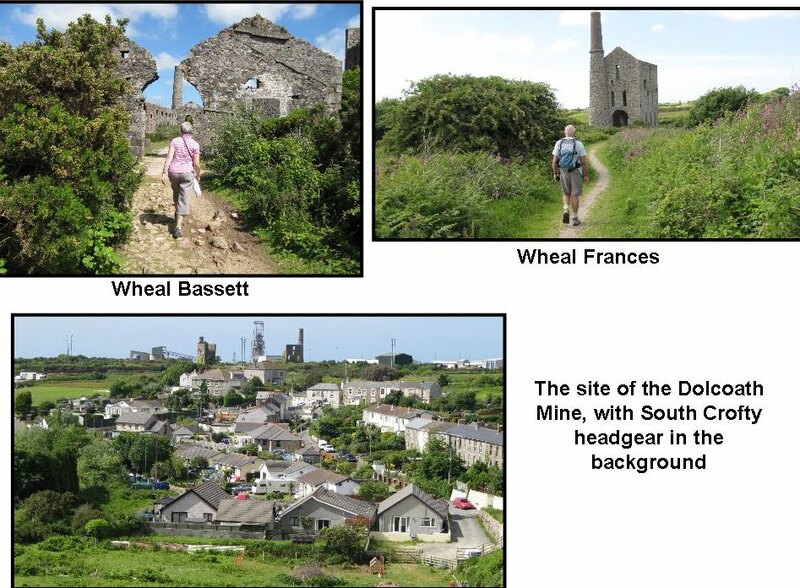 The Great Flat Lode Trail encompasses all the major mines of the Camborne-Redruth area running in a 7.5 mile multi-use circular trail around the granite hill of Carn Brea. Perhaps most evocatively, the trail passes by the site of Cornwall's greatest mine, Dolcoath, once, at 3000ft, the world's deepest tin mine, and the biggest producer of copper. As with most of the mines, in the late 19th century it became a tin mine, but modern development has left little trace of this mighty operation. The trail passes through the famous Bassett Mines area (see posting of 11th June 2009), familiar to many past MEI Conferences delegates (the photo on the left was taken at Reagents' 04). Also on the trail is the excellent King Edward Mine Museum (posting of 28th May). Just off the trail, on the main Camborne-Redruth road at Pool, are the East Pool and Agar engine houses, which have been restored and open to the public (YouTube). With only 5 more days to go to Precious Metals '10, there is a timely article in MEI Online by Alan Taylor of ALTA Metallurgical Services, Australia. Recent gold industry news has understandably focused on the meteoric price rise. However, although processing technology has been out of the limelight, it has not been standing still, and developments have been occurring in a number of key areas, which are detailed in the article, and will be discussed at the conference next week. Just over a year ago I formed the Minerals Engineers group on LinkedIn. It has gone from strength to strength, and today reached over 500 members. It wasn't easy to get people to join in discussions initially, but now these have become very active and useful, on a variety of topics. If you are a member of the group, I encourage you to persuade your colleagues to join. A 500-strong membership is good, but we are only just scratching the surface of the mineral processing community. This week's MEI Online newsletter was emailed directly to around 7000 subscribers! 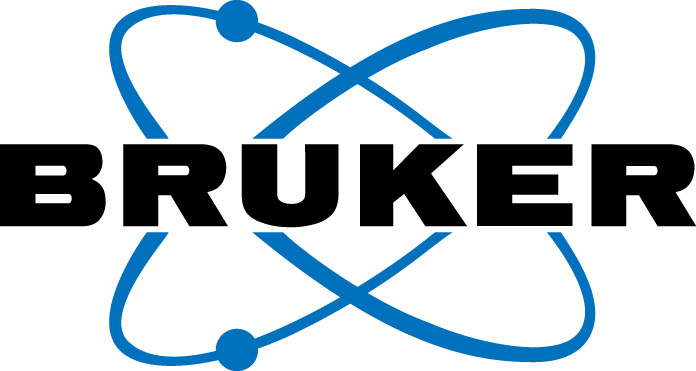 We welcome Bruker who join ALS Mineralogy and IMP Holdings (see posting of 30 March) as major sponsors of Process Mineralogy '10. Bruker designs and manufactures analytical X-ray systems for elemental analysis, materials research and structural investigations. Abstracts are now being received for this conference, and the deadline for submissions is the end of this month. It's good to see geometallurgy in the news again, MEI Online reporting on AMIRA's geometallurgical mapping and mine modelling’ project. Simplified, this is the mineral world’s equivalent of a DNA test. It is similar to looking at a person’s genes at birth and predicting what’s going to happen to them in later life. It is the promise of significantly enhanced knowledge of how an orebody will behave that has led to substantial financial support from major mining companies, with 12 sponsor sites already nominated for future work. I am hoping that we will hear more of this project at Process Mineralogy '10, as geometallurgy is one of the major themes of the conference. We attended an excellent Camborne School of Mines reunion today, and in the afternoon had a fascinating visit to the Heartlands Heritage Site, where, among other things, the old Robinson's shaft (left) near South Crofty Mine is being regenerated, together with its compressor house and other associated buildings. The 80 inch cylinder Cornish Beam engine operated from 1908 to 1955, pumping from over 1200 feet depth. It was the last beam engine to pump water from a Cornish mine. It soon became derelict, and subject to vandalism, but a grant from the National Lottery has enabled the Heartland's project to regenerate the whole site, and it is hoped that in a couple of year's time the area will be open to the public, and the beam engine will run again, driven by steam. On the left, I am pictured with Ron Hooper, ex-head of surveying at CSM, Sheila Parker, widow of Roger Parker, ex-vice-principal, and John Shrimpton, ex-head of mining. Less than 2 weeks to go now and its not too late to register for either, or both, of these conferences. Blog readers can now take a look at the timetable and abstracts for the conference, here for Precious Metals '10 and here for Nickel Processing '10. There are discounted rates should you wish to register for both events. 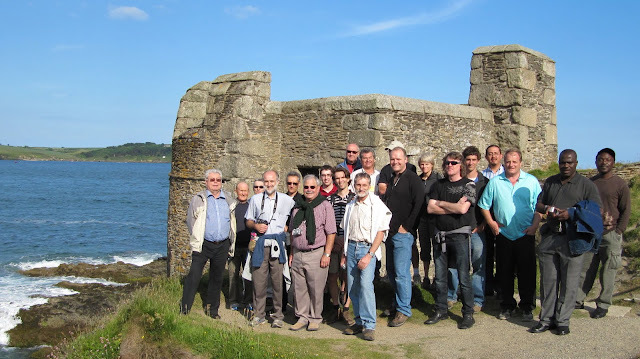 Next year we will be running Physical Separation '11 in Falmouth, where one of the themes will be "Gravity concentration methods - single and multi-G separators and dense medium separation". Gravity concentration is the oldest method of concentration, and gravity machines come and go- my blog of 28th May mentioned buddles, round frames, rag frames and Frue vanners, machines all consigned to history and museums. With the advent of froth flotation in the early 20th century, many people thought that gravity concentration would become obsolete, but it survived. New machines were developed, such as the shaking table, and spirals, which still survive today, but many remained on the scene for only a short time. Who remembers the Bartles-Mozley Frame, the Bartles Cross-Belt Separator, and Duplex Concentrators? Are they being used anywhere now? And what about the Reichert Cone which was widely used in the 70s and 80s- is it still manufactured and used? Gekko, Falcon and Knelson enhanced gravity concentrators now seem to dominate the industry - did the Mozley Multi-Gravity Separator ever become a major player in this area? Let's have your views on the current status of gravity concentration in modern mineral processing plants. For the first time ever, Cape Town's Vineyard Hotel will host three MEI Conferences back to back in November. Biohydromet '10, a 2-day event, will be immediately followed by the 3-day Process Mineralogy '10 and the week finishes with Zinc Processing '10 (2 days). There are discounted rates for those wishing to register at more than one conference. There are now final calls for papers for these conferences. If you wish to present papers, please submit your short abstracts to me no later than the end of this month (full details can be found on the Call for Papers section of each conference website). Decisions on abstracts will be made in July, and draft papers will be required before each conference, for inclusion in the respective Proceedings CDs. After the conferences, authors will be invited to submit final papers to Minerals Engineering for peer-review. If these are accepted, they will form special issues of the journal, which will be published in mid-2011. Minerals Engineering recently received the top ranking of A* by the Australian Research Foundation.